Do you or a loved one snore at night, wake up periodically during the night choking or grasping for breath? Wake up still feeling tired in the morning? Have headaches in the morning? Experience fatigue during the daytime? Have difficulty falling asleep or staying asleep? These are symptoms of a potentially life-threatening disorder called sleep apnea. According to The Center for Disease Control, an estimated 100 million people worldwide have sleep apnea. Equally alarming, 80 percent of these people remain undiagnosed. Sleep apnea is a sleep breathing disorder that restricts breathing during sleep, particularly during the REM sleep stage. Sleep apnea causes your airway to narrow or close during sleep, causing soft tissue vibration that results in snoring. Consistent snoring is a major indicator of sleep apnea. Furthermore, the airway narrowing also triggers an arousal response in your brain -- similar to someone trying to wake you ever few minutes. While you may think you experienced a sound night's sleep, your sleep cycle may have experienced hundreds or thousands of disruptions. Rather than feeling refreshed upon waking, sleep apnea sufferers describe morning headaches, trouble concentrating, and daytime fatigue, memory problems and increased emotional instability including depression. 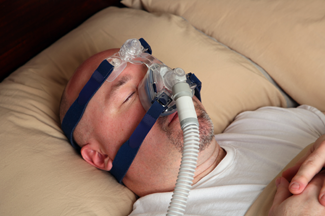 Sleep apnea can be life-threatening. It is a common cause of car accidents due to drivers falling asleep at the wheel. Sleep apnea also increases your risk of a heart attack, stroke, diabetes and high blood pressure. Patients with sleep apnea often have a shortened lifespan as well. While there is no specific profile for those with sleep apnea, the disorder is commonly seen in individuals who are overweight or obese. However, sleep apnea can occur in many people even though they are at their ideal body weight. For those who are overweight, sleep apnea can also impede the ability to lose weight. Many individuals who suffer from sleep apnea are unaware they have this condition. Bed partners are often the first to notice irregular breathing patterns during sleep. Sleep apnea tends to get worse with age. Thankfully, sleep apnea is a reversible disorder when under the care of a medical physician who specializes in sleep disorders. Contact us today to learn about the various treatments available.